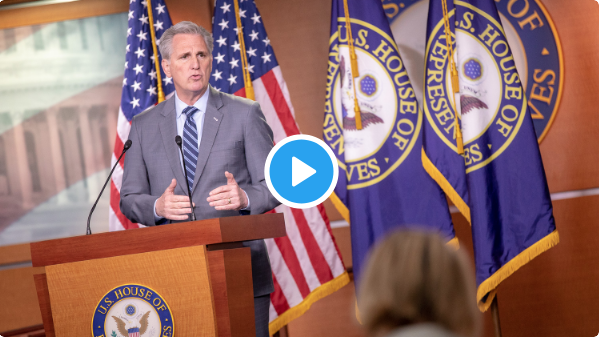 At his weekly press conference, House Republican Leader Kevin McCarthy (CA-23) expressed disappointment in the Democrat majority for wasting the American people’s time by introducing nonbinding resolution after nonbinding resolution rather than effective legislation, and for failing to stand with our ally Israel and condemn the Boycott, Divestment, Sanctions (BDS) movement. “I want to mention something that just happened on the House floor. I did not think this day would come – I did not think it would happen in the House of Representatives, and I did not think it would ever happen in America. “The Boycott, Divestment and Sanctions (BDS) movement aims to deny Jewish people the right to self-determination in their ancestral homeland and it seeks to destabilize the Jewish state by encouraging a targeted economic war against Israel. “The BDS movement is not interested in coexistence – it seeks further conflict and is unwilling to make concessions. “The Democrat majority has blocked a vote on opposing BDS over and over again. They refuse to take up S.1, which passed the Senate by 77 votes – tell me what passes the Senate by that high of a margin. But this new Democrat Socialist movement in the House won’t even assign it to a committee. “They refuse to mark up its companion version, HR 336. And they refuse to bring to the floor a simple bipartisan resolution, H.Res.246. They bring a lot of House Resolutions to the floor, but they refuse to bring this one, which condemns the BDS movement. “Today was most shocking. Today was a day in history I did not want to see in America. Today, every Democrat but five voted against an amendment to reject the BDS movement. Every Democrat but five would not stand with Israel today. This is a turning moment for America. “There was a story today in Roll Call that shows just how small the Democrat majority’s legislative agenda actually is. Sixteen percent of the bills this majority has brought to the floor have been non-binding resolutions. When you remove suspensions, that number jumps to 21 percent. Nearly a quarter of the most important bills brought to this floor have been non-binding resolutions. “And if you thought they might slow down — that they got it out of their system — think again. “They just introduced another non-binding resolution on the President’s consideration to shut down the southern border — an action the President hasn’t even taken. “Speaker Pelosi has turned the House of Representatives into the House of Non-Binding Resolutions. “When I campaigned, I never heard one person tell me to go to Washington to pass a non-binding resolution. The American people sent us here to solve problems — not to take messaging vote after messaging vote.